My dearest readers let me just tell you now – I have some great things in store for you today! These are the first Ellagee polishes that I’ve ever gotten but I can tell you right now these will NOT be my last!! Furthermore you’re going to start to see me branch out into colors and finishes and effects that I haven’t touched on yet! First up is Not the Droids You Are Looking For. Look how fun! NtDYALF is a clear based glitter topper. There are just tons and tons of gold, silver, and blue dots inspired by C-3PO and R2D2! The glitter spread was very nice and I didn’t have to manipulate it much if at all. These pictures show one coat over undies! Next we have one that I was really really excited about. 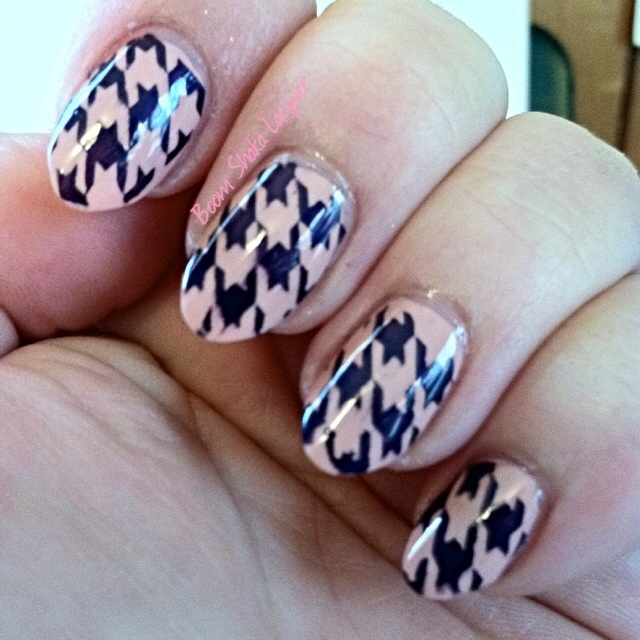 The only disappointment is that I am not able to do this polish justice in my pictures. I give you La Fée Verte. Well actually I’m not giving it to you this one is MINE! Look at that lovely green fairy! This polish comes from Ellagee’s Cocktail Hour collection and this is a thermal polish inspired by Absinthe. When it’s warm it is a lovely silvery gray with just the barest hint of green. When it is cool it is a deeper green. Also sprinkled throughout is a smattering of holographic micro-glitters. 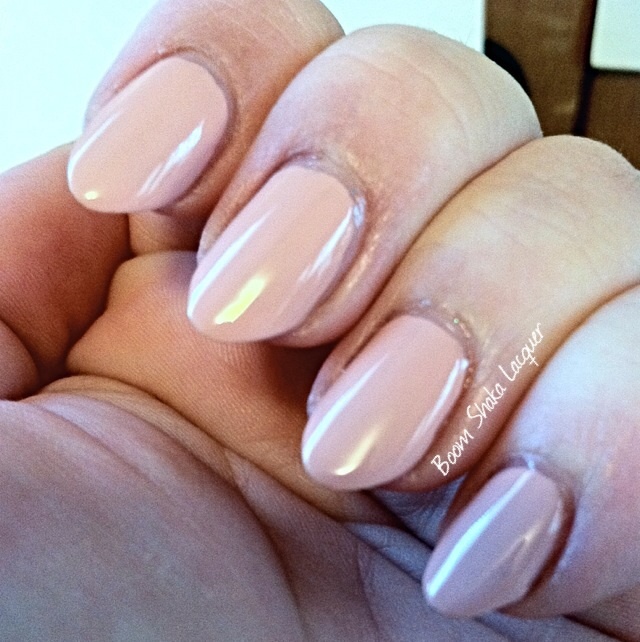 Application was easy breezy and the thermal effect is really very neat I just couldn’t seem to capture it very effectively, it was pretty cold in my office and I would get my nails warmed up as best as I could but these pictures show it closer to the cool (temperature) shade. This polish actually dries to a very lovely satiny finish, not really matte, but not super blinding shiny either. These pictures show two coats with topcoat. Really, I could faint over this. It’s so gorgeous. I know that this kind of color is a real departure for me. I am not one to go in for a bunch of neutral shades. This however is so amazingly classy, classic, and just lovely. Everyone Wishes for Silver and Gold is an ivory crelly packed with multi-sized gold, silver, and white metallic and holographic circle glitters! You know I am a complete sucker for circle or dot glitter. The overall effect is just so delicate and lovely. I will probably be reaching for this one more than once this Holiday season! You’ll have to act quick for this one though it is a limited edition for the Holidays only! Picture shows two coats and the glitter spread was very nice and easy and didn’t require any major placement or manipulation. I do like that I seemed to get a good mix of all the glitters on my nails, even the larger dots were no problem at all. I did use glitter food, although I probably could have gotten away with not using it and just opted for an extra thick coat of HK Girl. I am thrilled with these polishes and I foresee many more bottles of Ellagee polishes making their way to nest here at my house. You can buy Ellagee polish here and keep up to date on all the news, sales, and contests on the Ellagee Facebook page! This is a bit different for me I know. I recently reached out to Tip Top Nails, a nail polish company in South Africa because I had read some wonderful things about their polishes from international bloggers and I was interested in seeing if these were polishes I could get in the states. They very kindly emailed me back and offered to send me a package of their products for me to try out. I got four delicious polishes, three cremes and one metallic/shimmer finish polish and they also sent me their Toughen Up Maxi Growth Base and Top Coat. I cannot begin to tell you how great these polishes are. As a blogger and a nail polish aficionado it is necessary that I have great polishes to use for nail art and stamping and undies! Who wants to put on two coats of undies on before a glitter topper? Not this girl. With these Tip Top Nail lacquers there will be no need to put on two coats! The formula is the same across the board. Every single one of the colors they sent were ONE COAT WONDERS!!! That’s right my lovelies sound the alarms! Furthermore the creams had no balding, no streaking, and they were beautifully SELF-LEVELING! I took a picture of the light pink color, Meringue Surprise, on its own because it is pastel and pastel cremes can be notoriously tricky to apply. Not this one…just look!! These pictures show ONE COAT of Meringue Surprise with the Tip Top Topcoat (say that three times fast). *Squeeee! * it’s so shiny and just perfect!! Polishes used in these manicures: Tip Top – Maxi Growth Basecoat, Meringue Surprise, Purple Reign, Cherry’s in the Snow, Cha-Cha-Cha, and Maxi Growth Topcoat. Seriously – even the pink stamped cleanly and clearly. I am so excited about these. 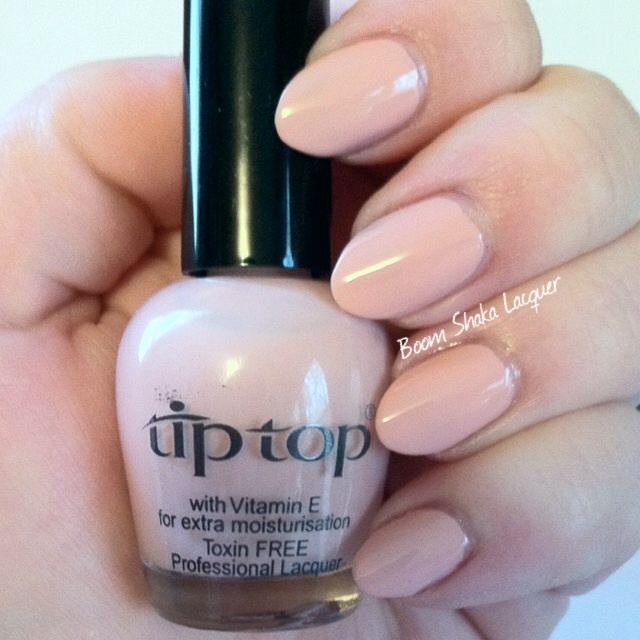 I emailed Tip Top Nails and while there is not currently a retailer in the US or that exports to the US if you contact them directly they would be happy to sell them to you and ship them out. You can view there product lineup on their site!! You can also visit them on facebook! 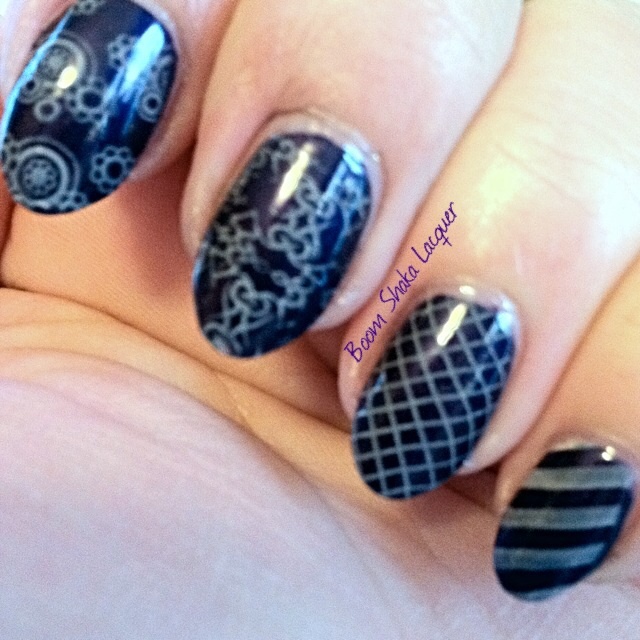 This entry was posted on November 27, 2013, in Nail Art. Hello my lovelies! 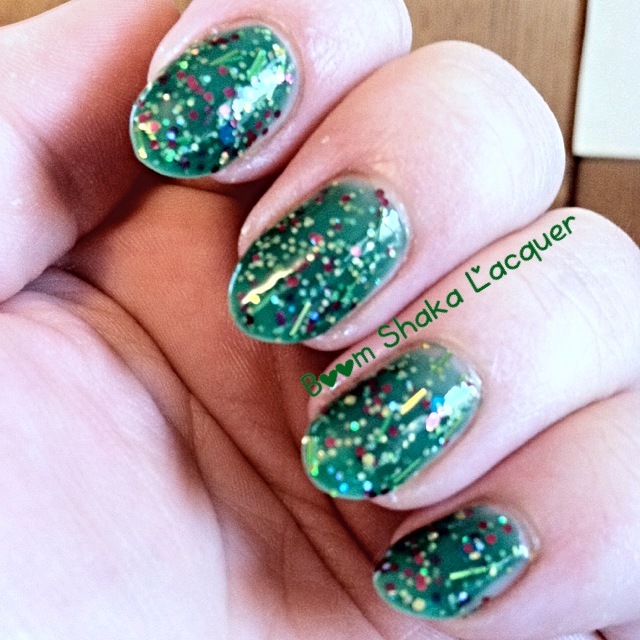 I have three AH-Mazing polishes from Big Spoon Lacquer’s Holiday collection to share with you. I am super excited to show them to you! Big Spoon Lacquers is a brand new indie polish line and so far I have been uber-delighted with Pauline’s lacquers! I could not pick a favorite from these three! 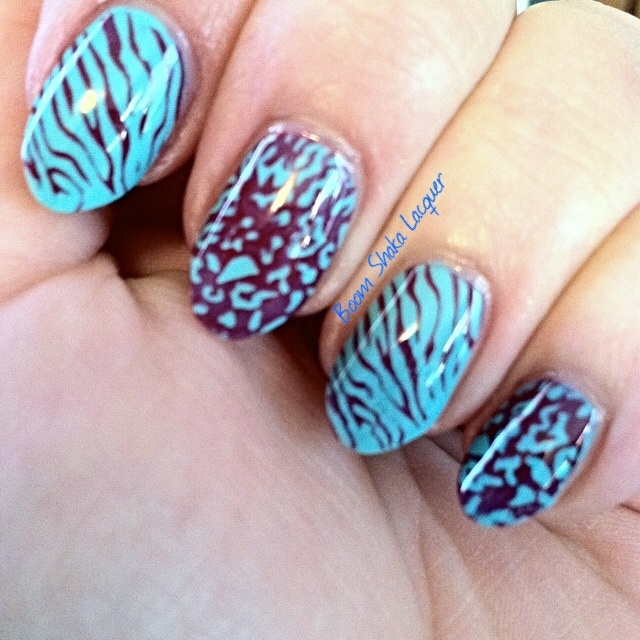 I’m going to cut right to the chase and show you these pretty polishes! First up we have Meet Me Under the Mistletoe! Meet Me Under the Mistletoe is a delightfully delicate and feminine polish. It made me feel all kinds of girly! 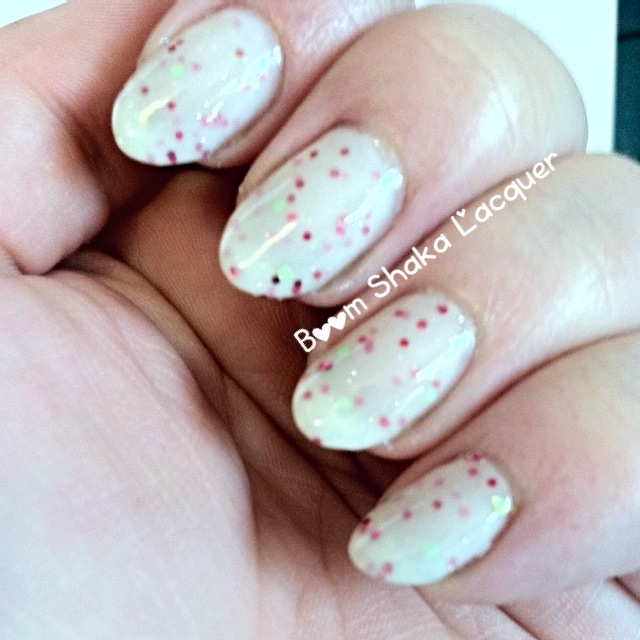 The polish is a sheer white crelly with a sprinkling of metallic magenta hexes and metallic lime green dots. It does go on sheer as I mentioned but it does build up nicely or it could be paired with undies. I do not tend to like using undies for jelly or crelly polishes as it causes them to lose some of their squishiness (which is the reason I love them). Picture shows four thin coats with topcoat. As with the other Big Spoon Lacquers I reviewed here there was no need for glitter food and the glitter spread is very nice and required no manipulation or fishing. Polishes used in manicure: Glisten & Glow Stuck on Blu, Big Spoon Lacquers Meet Me Under the Mistletoe, Glisten & Glow HK Girl Quick Dry Topcoat. Next up we have a BEAUTIFUL jelly based polish. I have to tell you I knew when I saw the pictures of it that I would need to own it. Kiss Me at Midnight is a lovely polish that I can see working for the Holidays or all year long! As with all jelly polishes this one is another sheer polish but it does build up to opacity or it can be paired with undies. Kiss Me at Midnight is a squishy denim blue jelly polish and it is packed with aqua and magenta micro glitter. I LOVE it! I actually would have done just two coats but there would have been a little more VNL which I would have been ok with but I did three which shows only the tiniest bit of VNL and four coats would have reached full opacity. It was a dream to apply. Polishes used in this manicure: Glisten & Glow Stuck on Blu, Big Spoon Lacquers Kiss Me at Midnight, Glisten & Glow HK Girl Quick Dry Topcoat. Finally, my favorite of the three that I received. It is simply to die for. 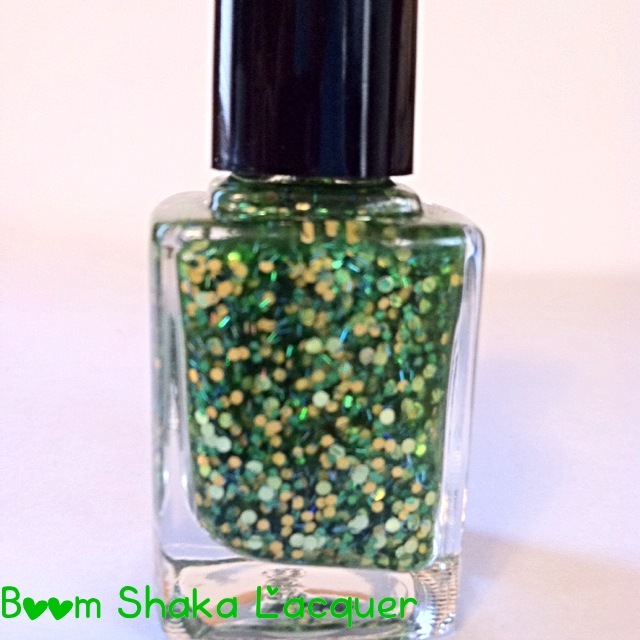 This lovely polish is Christmas Tree In a Bottle. It literally LOOKS like a Christmas Tree in a Bottle. I was giddy with excitement that I received this polish in my review package. It is a real stunner of a polish and one that I foresee being one of my all time favorite Holiday polishes. 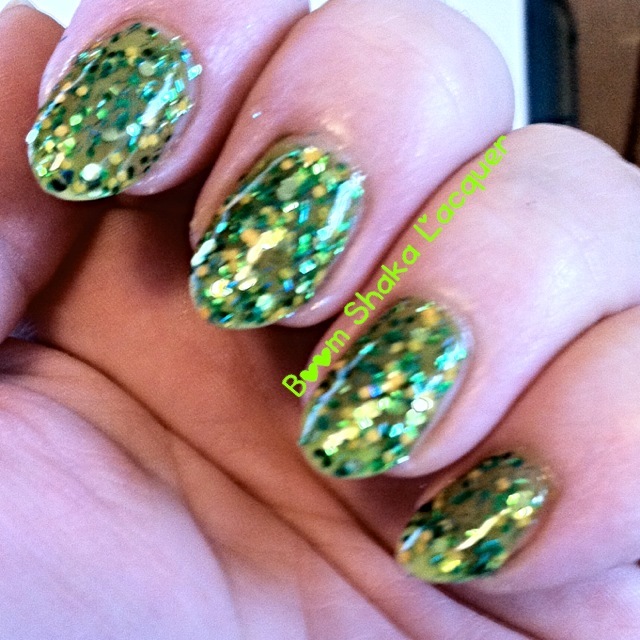 Christmas Tree In a Bottle is lovely green jelly based polish with tiny matte yellow and medium sized matte blue hexes, tiny metallic magenta hexes, teensie tiny holographic dots, and holographic gold bars. It catches the light so beautifully and just sparkles and glitters like crazy! It is a jelly based polish but builds up to opacity in TWO coats – all of the squishiness that you could dream of in a jelly based polish and as with all of Pauline’s glitter polishes is it packed to the brim with all kinds of glittery goodness, no fishing, digging, manipulating, or otherwise messing around just easy breezy application! Polishes used in this manicure: Glisten & Glow Stuck on Blu, Big Spoon Lacquers Christmas Tree In a Bottle, Glisten & Glow HK Girl Quick Dry Topcoat. Now, Big Spoon Lacquers is having a PRE-Black Friday sale so that you can get amazing prices without having to schedule it in with all of your other Black Friday shopping! The sale starts TOMORROW November 22, 2013 at 6PM EST. Here are the sale details: All polishes are $5.50 alone or priced at $5 if they are bought in a set. It’s site wide. There will be grab bags of 3 minis for $6. And any orders of $15 or more will receive a free mini of a shade that is only available through this offer which is a dark green with light green and darker green shimmers throughout called Shop Til You Drop. Also, 20% of all sales (not just profit) will be donated to a former SEAL whose dog was hit by a car yesterday to help pay for vet costs that are estimated to reach upwards of $10,000. You can find out all about this and other news about Big Spoon Lacquers on their facebook page and you can pick up all of your favorite lacquers at their shop! 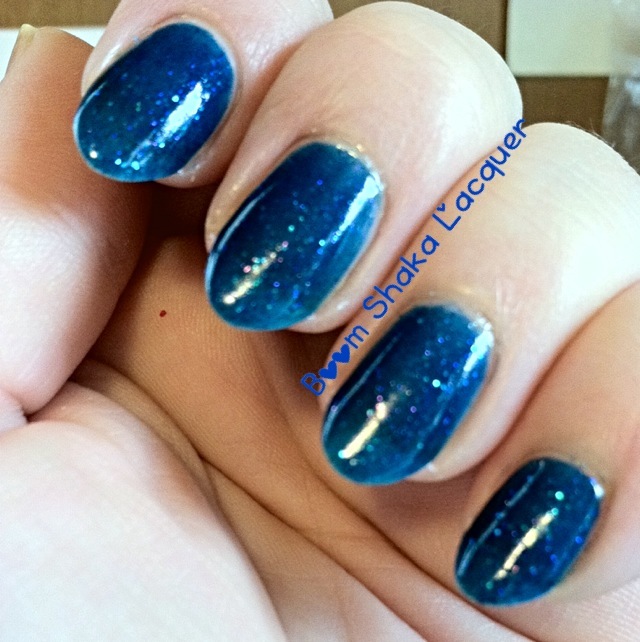 This entry was posted on November 21, 2013, in Big Spoon Lacquers, Indie Polish. Hello all you lovelies out there! I have something super exciting to share with you! It is no secret that I love indie nail polish. In fact I would say I probably hit you over the head with that fact on a right regular basis. Don’t worry there will be no actual hitting! 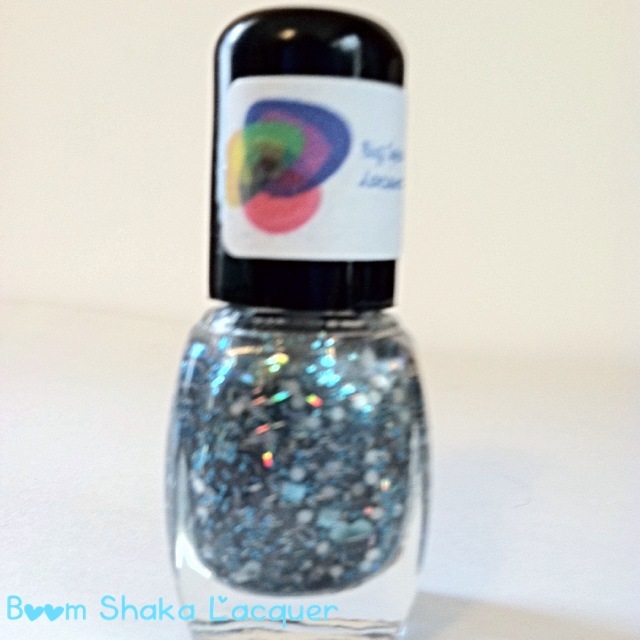 Instead, today I’m bringing you the first of two posts featuring a brand new indie polish brand, Big Spoon Lacquers! 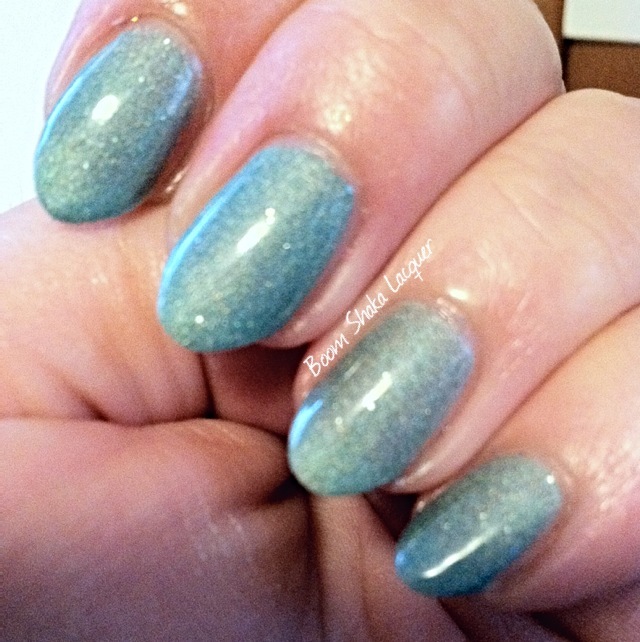 So in this first post I’m going to share two of the polishes from the Norway Collection. 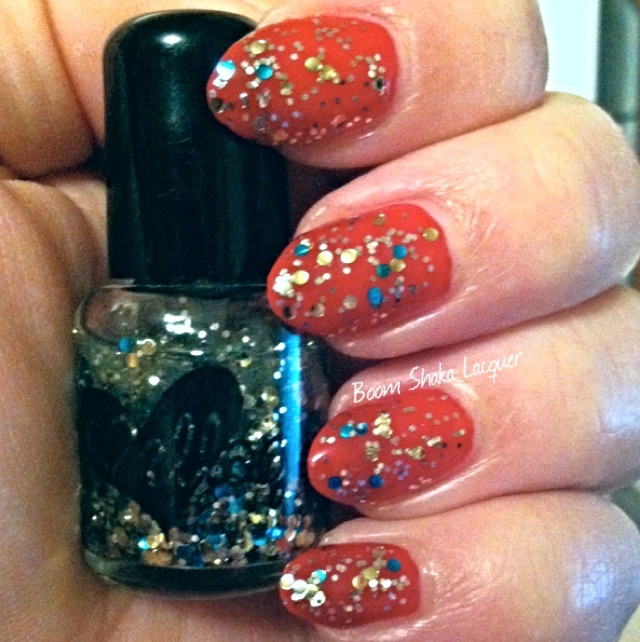 This is Pauline’s inaugural collection that includes some really amazing glitter polishes! All of the polishes in this collection are based on “the natural beauty that can be found in Norway.” Let me just say that I’ve never been to Norway but I could imagine any of the 5 polishes in the collections being very representative of that country! Up first I have Geirangerfjord (Go ahead try to say that five times fast, I dare you! No? Alright carry on.) This is a stunner of a polish even though I was slightly apprehensive about the yellow glitters! Yellow and I are not the best of friends. I needn’t have been apprehensive AT ALL. I loved this polish far more than I expected to! Geirangerfjord has a yellowy-green tinted base is and is PACKED to the brim with a multitude of glitters: tiny metallic green hexes, tiny matte yellow hexes, teensie weensie little green bar glitters, and metallic gold dots. 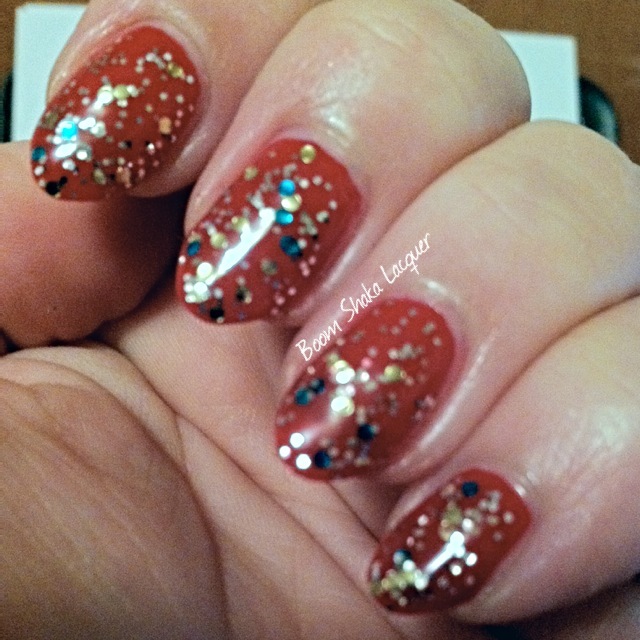 Even though this baby is packed to the brim with glitter they all lay nice and flat to the nail, the spread was lovely and even without any manipulation, and pictures show three coats plus topcoat – NO Glitter Food was necessary to smooth it out! Polishes used in this manicure: Glisten and Glow Stuck on Blu Basecoat, Big Spoon Lacquers Geirangerfjord, Glisten and Glow HK Girl Topcoat. Next up is my favorite of the two I’m reviewing today, Trollveggan. Trollveggan is so flipping amazing that I almost couldn’t contain myself when I put it on! It’s just lovely! It makes me think of icy seas and cold cloudy days when I look at it! I don’t really know where to start. I loved every single thing about this polish! It is absolutely beautiful. Trollveggan has a pearly gray base that is packed to the brim with glitters, just like Geirangerfjord. There is metallic aqua microglitter, medium sized metallic aqua hexes, small matte silver dots, and tiny holographic gold bar glitters. It’s utterly stunning and pictures do not do it justice in the least! I will say that the aqua hexes do have a slight reflective curl but it does not translate to the glitter itself and everything spread out and laid on the nail perfectly flat without any issues at all. Neither of these two polishes required any special fishing and manipulation to come up with a good glitter payoff! The picture shows 3 coats plus topcoat, I personally would have stopped at 2 however there was a slight VNL at two coats that would not have bothered me in the least but I know that some people don’t care for it so I pushed it to three for the pictures to show you can reach opacity easily. Again, no Glitter Food was necessary to achieve a smooth glassy finish! Polishes used in this manicure: Glisten and Glow Stuck on Blu Basecoat, Big Spoon Lacquers Trollveggan, Glisten and Glow HK Girl Topcoat. I was extremely delighted with these polishes. 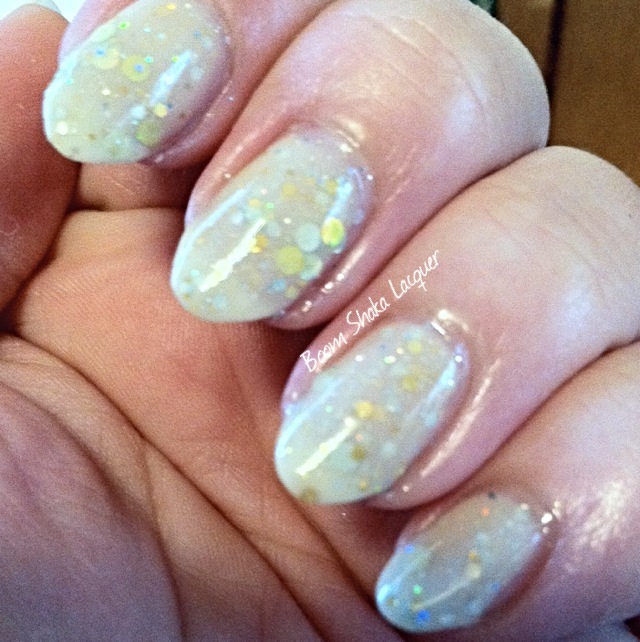 Too often I play hunt and fish for glitters or I have to manipulate the glitters on the nail once I get them there. I didn’t have to do that with these polishes. They are sheer but they build up very nicely to opacity without any hassle or problems. I foresee many Big Spoon Lacquers in my future! You can keep up to date on all the happenings with Big Spoon Lacquers at their facebook page and instagram and you can purchase them in their online shop!